Oil on canvas, 131 x 162 cm. The Holy Family is resting in a dimly lit stable in Bethlehem. The Virgin Mary slumbers with her back against the manger where the infant Christ Child lies asleep, while Joseph also rests with his cheek supported by his left hand. In his depiction of the Holy Family, Ferdinand Bol creates a striking contrast between the lit and shaded areas. 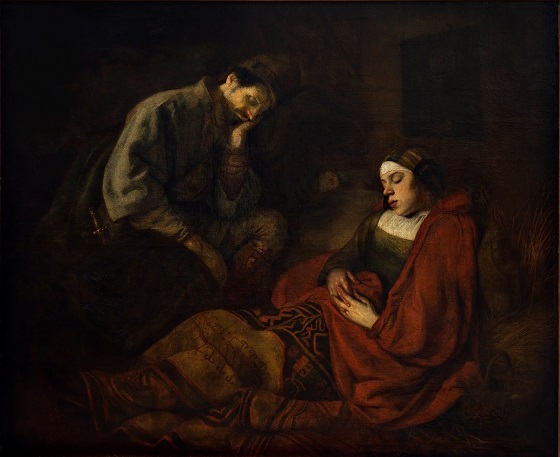 The influence from his old teacher, Rembrant van Rijn, is evident through his application of the chiaroscuro technique. His depiction of the Virgin Mary as a typical, ordinary woman distinguishes this scene from prior Italian artists’ awe-inspiring and idealised depictions of the Holy Family in Bethlehem.